Probably hard to believe in the light of recent events but back in the 60s Rolf Harris’ manager wanted to have Sandie Shaw banned from the bearded Aussie paedos TV show to preserve Rolf’s clean-cut image. What had Sandie done to cause such a furore? She had an affair with an older married man. That man had lied to her about being married as well. 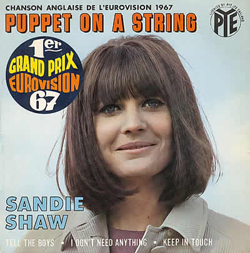 Sandie was scheduled to sing the six song candidates for the UK entry for Eurovision 1967. The rather dreadful “puppet On A String” eventually won. Clearly no damage was done to the reputation of Jake The Peg either. He damaged that reputation himself; if only he had been found out back then! Anyway, enough of the bearded weirdy, enjoy some classic Sandie Shaw. Personally I think she has always been horrendously underrated. What do you think?